I, Effing Feline, fear that I may have given my gentle readers the idea I’m mean, ill tempered, narcissistic, and cantankerous. A devil cat, so to speak. Now that we’ve cleared that up, another selection from The Trial of Tompa Lee by my pet human Ed, aka Mr Valentine. Last week Tompa conned a guy into getting her into the briefing about her first ever shore leave on an alien planet. After the briefing, sailors chose small groups for the trip. 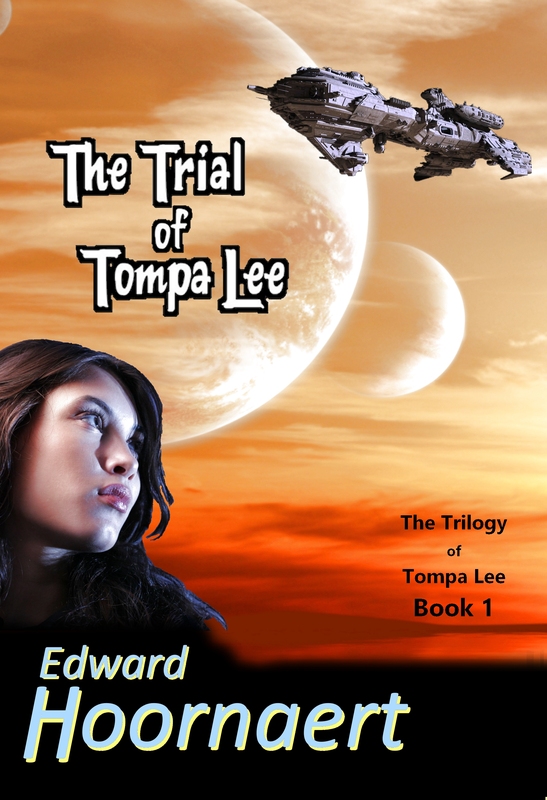 Tompa Lee thinks joining the Space Navy is her dream come true, but it turns into a nightmare when she’s framed for murder on an alien planet. To prove her innocence, she’ll have to learn to trust the hated policeman who betrayed her to cruel alien justice — and defeat 300 aliens who want to slaughter her. If you enjoy cheering for lowly underdogs facing awe-inspiring odds, you’ll love The Trial of Tompa Lee. I designed this cover myself, so feel free to give me your feedback on it. Belonging to the space navy has long been her dream and though the dream is starting to sour, she’s nowhere near ready to give up on the dream. She’s tough but practical. Good snippet. There’s a lot to like about her, that’s for sure. Brave gal to go despite that she knows they do not care for her kind. I’m intrigued to know more. She’s faced prejudice all her life, so this is just another incident to force her way through. One very determined woman ! Accompanying Space Navy sailors as they tread an alien planet for the first time — this is what Tompa THINKS she wants out of life. I always sympathise with the underdogs. You show ’em, Tompa! This book is on my Kindle, waiting to be read. Looking forward to it. I always root for underdogs, too, and love to read about them. Tompa is my most extreme underdog, and yet by the end of the trilogy she has risen to unthinkable heights. Tough girl. I bet she makes it. Tweeted. Her survival skills have been well honed by the rotten environment she grew up in as an orphan. She has so much heart! Yes; it’s what has carried her through a really hard life. Ooh, free book! Count me in! Loved this snippet, Ed. Particularly this line: How the ratshit was she supposed to make full Navy with crap like that on her record? Speaking of, I’d love to know Effing’s thoughts on ratshit. ‘Ratshit’ is another of Tompa’s favorite words. I’ll have to ask Effing about his thought; thanks for the suggestion. Great snippet, Ed. Exposes her determination and her vulnerability – both qualities she’ll need to succeed. She has both qualities in vast quantities. Yep, she’s a toasted marshmallow. I’m not so sure about Effing, though. He might be more of a toasted pebble. I so love her inner thoughts. Now we’ve learned more about this interesting woman. Thanks, Ed. And she expresses those thoughts so … spicily. You just puffed his ego up another inch or so, Teresa. What’s this? Only two words? No poem? I’d go to see the aliens. Definitely, so would I. Maybe this compulsion is what makes us both write science fiction? Great exchange, but I do get the feeling her own responses aren’t making it any easier for her to fit in. So right, Ian. She’s so used to pushing people away that it’s really hard for her to get close. Great snippet–I felt like I was in the room with them. High praise indeed, Karysa. Thanks. “Hardened loner” holding back tears. Nice contrast. She’s not as hard as they think. But she’ll never, ever, let them see the tears, so how are they to know? Well, I admire that she’s going to go, no matter how she feels. I love the strength of the character. Excellent excerpt! All her life she’s wanted to trod an alien world, and this is her first chance. Effing – your pet human, haha I so love that! Anyways, I’m glad she chose to go. I love how strong she is. Great snippet! I’m sure that’s how cats (some cats, at least) think of us, as pets. Nice snippet–I can see where she’s tough and strong outside, but vulnerable inside. Crusty on the outside, gooey on the inside — a toasted marshmallow. She’s hanging in there. She has courage. She’ll need it, Elaine, she’ll need it. Love the duality. Not so much of a “hardened loner” it would seem. What I liked most about Tompa — liked well enough to write a trilogy about her — is that she’s festering mass of unresolved contradictions. I love the vulnerability she can’t show. Truly a lot like Effing. I suppose so … but Effing’s main points of vulnerability are his throat and his belly, and he likes both to be rubbed. Maybe she can prove them wrong. Or she can learn teamwork! She’s spectacularly great at survival. Teamwork … well, no. It takes the third book in The Trilogy of Tompa Lee for her to learn that. Love her determination! Go Tompa! Exploring alien worlds with the Space Navy has been her dream for a long time and she is, as you say, determined. This is now in the TBR pile on my Kindle — which I really should put on the charger. Thank you, thank you. Readers are such an important part of the writing process. As Ursula K LeGuin said, “An unread story is not a story; it is little black marks on wood pulp. The reader, reading it, makes it live: a live thing, a story.” This is one of my new favorite quotations. some members have an easier time being part of the team than others. Great snippet. She’s clearly one of the others. Good scene. Reveals why she’s so tough and determined. She is powerfully motivated, that’s for sure. Oh, and Effing…we all know you’re just a sweet little pussycat… with claws! LOL!